Good morning to all our friends this morning! Thanks for droppin back in to visit! As you know we started building a hog trap/pen a few days back on account of the dern pigs rooting up our pasture. We can’t let this continue, so…we have built the pen. For you folks who aren’t familiar with the damage these guys can do to a place, let me just say that it is considerable. A good size group of hogs can literally ruin a place in just a matter of days! 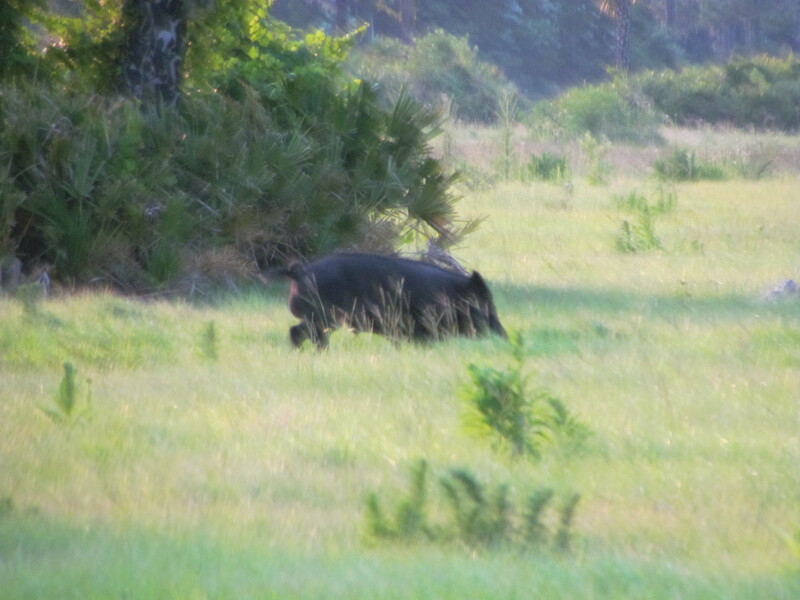 Wild hogs are really becoming a problem here in Florida. They’ve been around down here basically forever, but they seem to be really becoming more and more troublesome as well. Like I say, they can ruin a place in a flash. 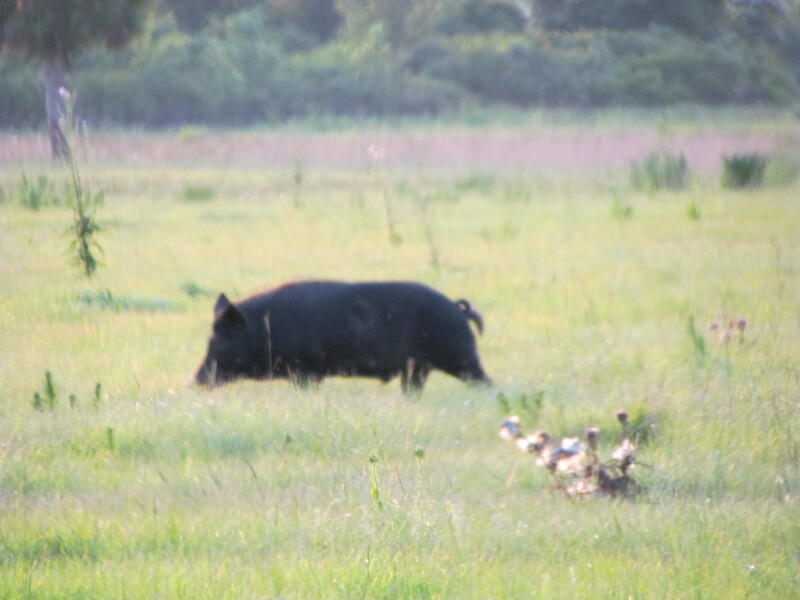 Florida’s wild pig population is second only to Texas. That says a mouthful when you consider how big Texas actually is. Sows can have two litters a year, and each litter may have up to 12 pigs. This is amazing to me when you think about it. Take Miss Piggy of The Muppets fame. I have no idea how many years we watched that show, and I can’t remember even one time where she wasn’t on the show, due to pregnancy leave?? Do you?? Evidently she is an exception to the rule, huh! Here’s a couple pictures of a good sized boar hog at the ranch in Yeehaw Junction. As you can see from our video below, we placed our pen up under an oak hammock. This will give them shade from the summer heat, and actually drop acorns in the pen too. It turned out nice, and the pen should be “just the ticket” in helping us get a handle on our problem here. Anyway, here’s the video of our finished product. Our next video is showing Red’s daughter, and our granddaughter Shelby Lynn. Once we videoed the hog pen she decided she needed one with her in it too. Being she has her Papa and Nana wrapped around her finger…she got her a video! LOL! Also Corey who works with us is 20. I aggravate him all the time about a girlfriend, so I’m now his “agent” if any of you young ladies are interested! He’s a great kid and a hard worker, so if you girls are lookin for a man, he’d be a good un, cause he’s still young enough for you to train! Send in your request…I’ll send you his number! Now ole Dale on the other hand has decided he too wants to use “Dub’s Dating Services,” but like I told him…there ain’t many out their older than you still kickin around, buddy. He agreed, but put in his application anyway. He’s looking for an independently wealthy woman, with a good sense of humor. Preferably over 80!! Shoot, after taking a look at his request of what he’s looking for, I may go through his replies very carefully. It seems what he’s looking for just might appeal to ole Dub too! Yee haw!! Closing out today, let’s take a look at another joke sent in by our friend Roger in Virginia. Roger sends me jokes all the time, so this morning I’d like to ask Roger a question…Hey man…ya gotta job?? LOL! You guys have a great day! God Bless you and yours, and Deb says once more… “Keep a smile on your face, and one in your heart!